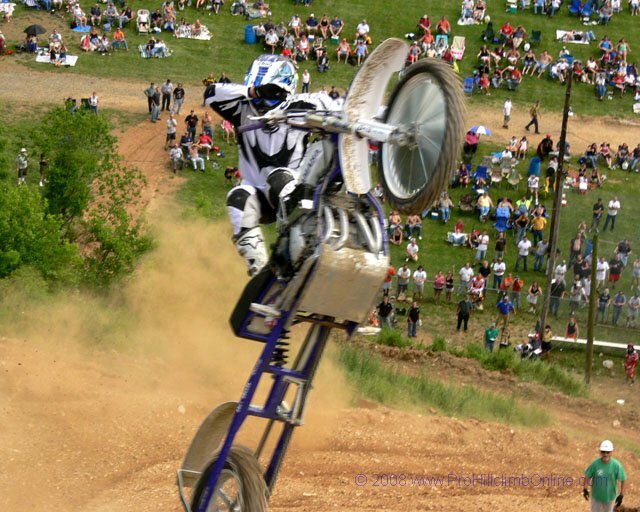 Tilted Horizons: AMA Pro Hillclimb Coming! Calendar June 5th to witness the return of those hillclimb crazies to the AMA Class A National event at the White Rose Motorcycle Club's hill near Jefferson, PA. I've attended this event a few times and it's a great time. If you've never watched a real hillclimb, you should. It's one of the oldest forms of motorcycling competition, and also one of the toughest...and most basic: fastest to the top wins (or furthest, if the hill beats everyone). At the White Rose hill, riders hurl themselves against a 300-foot dirt hill; two jumps on the way up make it even more interesting. They may have also added a turn since I was last there. Anyone lucky and fast enough to cross the finish line with momentum to spare often takes a final giant leap over the crest, which can lead to moments like this one. Bikes range from converted MXers to purpose-built climbers powered by old British twins or late-model 4-cylinder screamers running either nitro or NO2. That the club can be reached via twisty backroads makes the event that much more fun! In addition to June 5th, a second AMA points event will be held on September 25th, and White Rose hosts the All-Star event this season on July 24th. More event info on White Roses's site.